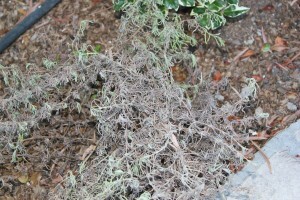 I have to say farewell to one of the lavender plants – the one I showed you on this post about mildew on lavender. As you can see from this photo I took yesterday the mildew has spread all over the plant and has not improved at all despite the spraying and treatment. In fact it looks a whole lot worse. As the Lavender plants are all planted so close together I am worried about it spreading to the others next to it. So I’m cutting my losses with this one and removing it and have to go get a replacement. 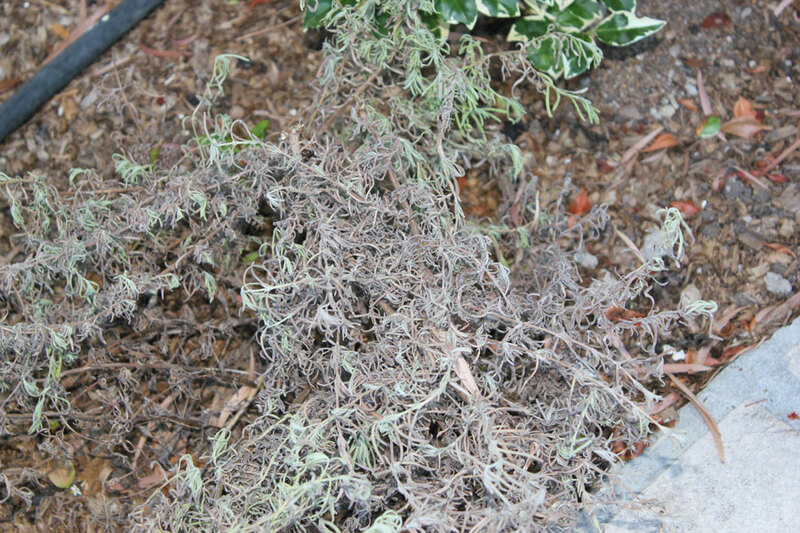 I really tried to save it but obviously I’m still to “brown thumbed” to revive sick plants. Sigh … On a positive note, the onme next to it seems to have recovered completely with no sign of mildew on it at all now. Have a happy gardening week! I realised today that I was really stupid to throw it out. What I should have done is pull it out, cut all the affected areas off and pot the roots and let it live in my little “green house” area – I have that area behind the garage where I put the “in transit” plants that is like a little hot-house. It might have grown again and could have been replanted later. I will do that in future and not just throw things away. I feel really bad about it now. Oh NO!!! Shame – how sad!! It is a problem with lavender. I nearly lost half of my big bush like that. Fortunately, it managed to come right. I did, however, have to treat it with organic fungicides and feed it with kelp fertilizer. But it left a gaping whole for a year.